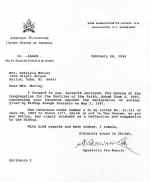 Honolulu Diocese & "The Hawaii Six"
On January 18, 1991, Bishop Joseph Ferrario, the local Ordinary of Honolulu (now deceased), served them a Formal Canonical Warning, threatening them with excommunication. 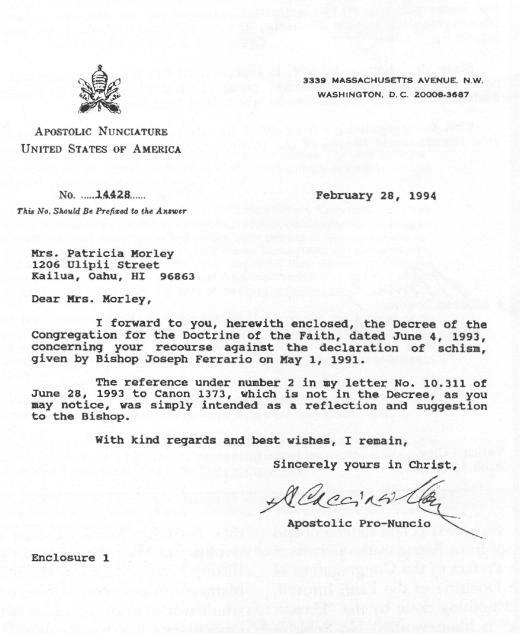 "Whereas you performed," Bishop Ferrario said, "a schismatic act, not only by procuring the services" of Bishop Williamson to perform confirmations at Our Lady of Fatima Chapel, "but also by that very association with the aforementioned bishop (you) incurred ipso facto the grave censure of excommunication." 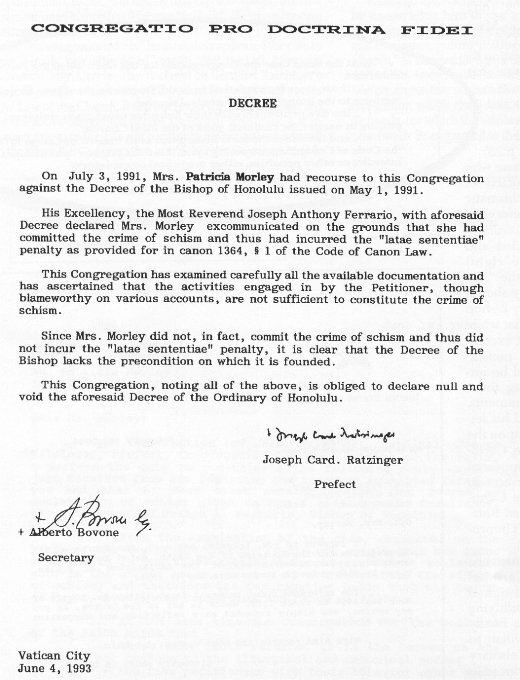 From the examination of the case, conducted on the basis of the Law of the Church, it did not result that the facts referred to in the above-mentioned decree are formal schismatic acts in the strict sense, as they do not constitute the offense of schism; and therefore the Congregation holds that the Decree of May 1, 1991 lacks foundation and hence validity. This is a declaration that the automatic (ipso facto) excommunication claimed by Bishop Ferrario for the followers of Archbishop Lefebvre is in fact totally non-existent. 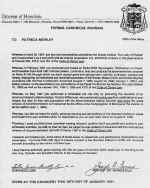 Though a major milestone to proving that those who follow and support the SSPX are neither schismatic nor excommunicated, reference number 2 of Archbishop Cacciavillan's June 28, 1993 letter, marred the clarity of the decree and the innocence of the petitioners by implying that sufficient guilt remained for them to placed under interdict by Bishop Ferrario. This was to say that while the Hawaii Six were not excommunicated and thereby members of the Catholic Church, they could have imposed upon them the "foreseen punishment of interdict...", an episcopal declaration that none of the Six could receive the sacraments of the Church. 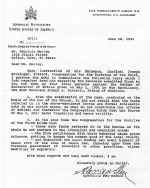 Because Archbishop Cacciavillan had opened the letter saying he was writing "upon the instruction of His Eminence, Cardinal Joseph Ratzinger," it appeared to all that the punishment of interdict was the recommendation of the cardinal himself. Well, it wasn't. 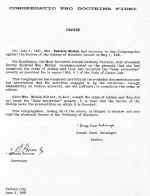 The actual Ratzinger Decree. No mention of interdict here! 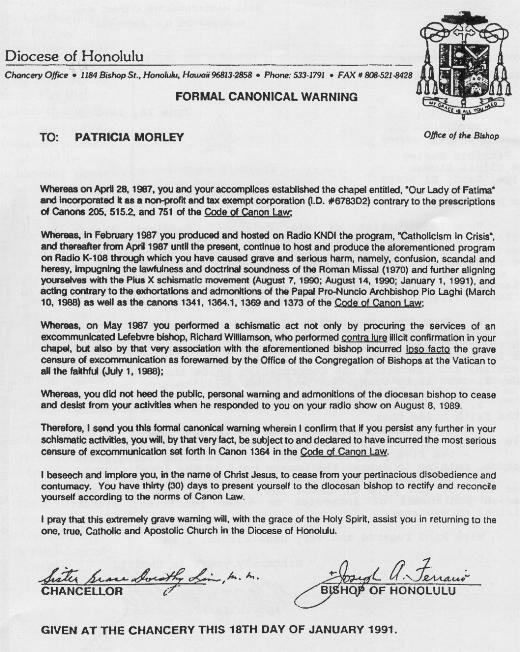 After nine months' insistence by the Hawaii Six, Cardinal Ratzinger's official, hand-signed decree of June 4, 1993 nullifying the excommunications was finally released by Archbishop Cacciavillan to the petitioners under his February 28, 1993 cover letter. 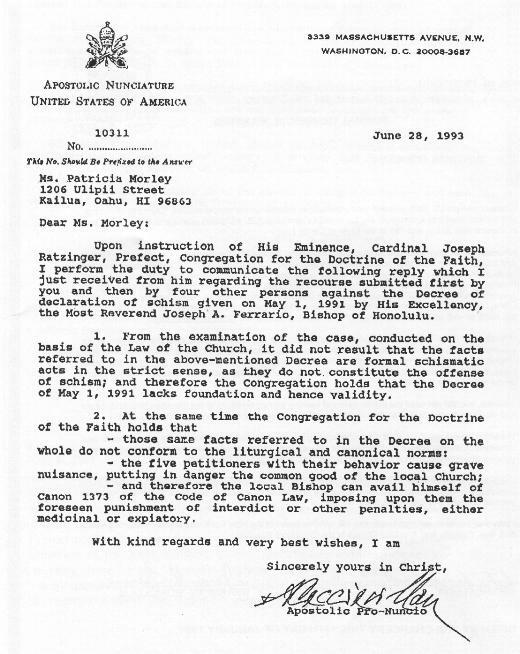 In this signed cover letter (reproduced in full at immediate right), Archbishop Cacciavillan admits that Cardinal Ratzinger said nothing about imposing interdict and, in fact, all of reference 2 is his idea alone and that Cardinal Ratzinger never said anything about "foreseen punishment of interdict or other penalties..."